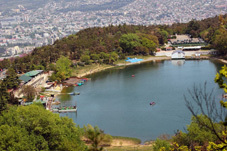 Tbilisi Mayor’s Office has suspended the construction of the hotel on the territory of the Turtle Lake, located at the outskirts of the capital. As the Mayor Kakha Kaladze explained, the construction was illegal. According to him, the City Hall suspended the construction permit of the company Armeland& Associates a few months ago, but the company continued the process illegally. “The removal of the land foundation was inadmissible. The supervision service received a notice and responded instantly. There is no construction permit on this object. Previously it was issued, but later the permit was annulled. It is not allowed to implement construction projects on such places, especially in the Turtle Lake Forest,” Kaladze stated when he arrived at the spot himself. 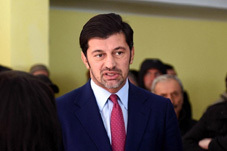 Kaladze says he understands the land owner’s position as well and instructed his deputies to work on finding another place for the owner of the land, where construction of the hotel was planned. “We should take into account the position of the landowner as well. He bought this land some time ago. My deputies will contact him and discuss the issue,” he added. A notice on the ongoing construction works on the territory adjacent to the restaurant Otumi at the Turtle Lake was received by the hotline of Tbilisi City Hall on Wednesday, after which the City Supervision Service immediately reacted to the fact. Media outlet Tbilisis Matsne says before preparing the foundation on at the construction site, some trees had also been cut there. According to the representative of the Supervision Service, they will carry out legal measures against the company after studying the case.